Cody spills about an upcoming production, his ties with the Hannah Montana cast, bizarre fan encounters, Leonardo Dicaprio, and more! If you're anything like me, you immediately recognize the name, Cody Linley. He starred as teen heartthrob Jake Ryan on Hannah Montana, Mullet Fingers from Hoot, and has been in many other television shows and movies over the years. I had always been a big fan of his work on screen, but I also was a big fan of Cody himself. He seemed so down to earth and genuine, so three years ago when he went on a following spree on Twitter and followed me (yes, it's his legitimate account - @CodyLinley7), I was ecstatic. 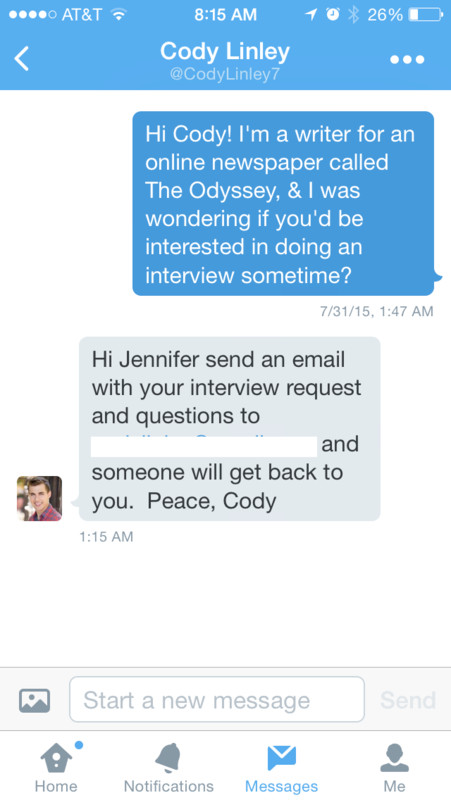 Then a little over a month ago, I decided to take a chance and direct message him asking for an interview. A month went by, and I had accepted the fact that he's a celeb and probably didn't have time to talk to normal fangirls like myself, but then I got a notification that I had one new message in my inbox. What?! Cody Linley messaged me back?! As I tried to contain my excitement, I wrote up some questions, emailed him, and then the correspondence began. So here it is, everyone: My interview with the one and only Cody Linley. Q: I know that the documentary, "Dream Chasers", featuring your mother’s acting students, including yourself, is being filmed right now. Can you tell me a little bit about that and how it’s going? 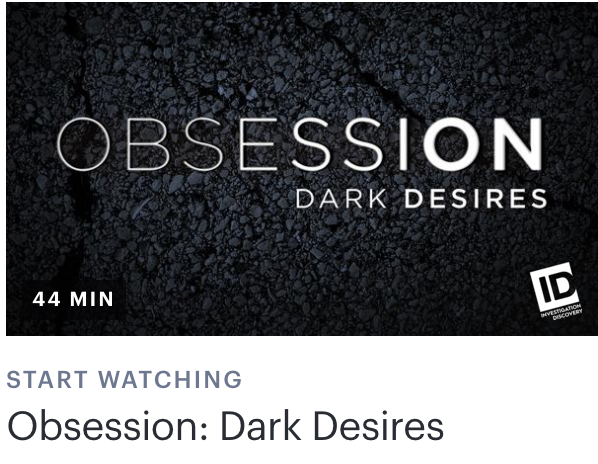 A: Dream Chasers is about how my Mom, (Cathryn Sullivan) has been successfully helping many acting students and I achieve our dream of acting professionally. The Director and creator of the documentary is the very talented Shaun Peter Cunningham. It promises to be an awesome documentary that helps tell the story of how Mom has helped worked to develop and discover such talents as Selena Gomez, Demi Lovato, Logan Henderson, and many more! Q: What made you want to begin acting? Since your mother is an acting coach, was an acting career expected of you? A: My very first commercial was for Ruby Tuesday’s when I was only four years old. I didn’t have an agent at the time and the audition was very spur of the moment as I was just hanging out with my Mom when we went to pick up her check from work which was at a casting office. A casting director saw me and thought I was cute and wanted to know if I’d like to audition for the commercial. My Mom said “No thanks, I think he’s a little too shy”, at which point I came out from hiding behind her leg and said “I’m not too shy, I can do it!” I booked the gig and filmed it shortly after. I remember working with adults and getting paid to have a blast! My older brother Chad was an actor, so I wanted to do what he did because it’s so much fun! Q: When some people hear your name, they immediately think “Jake Ryan from Hannah Montana!” Speaking of which, do you still keep in touch with any of the Hannah Montana cast or any Disney stars in general? A: "Working with the Hannah Montana cast was awesome and if ever we run in to each other at events or something we definitely support each other, but yes it’s been awhile since I’ve hung out with Miley or anyone that was on the show. I grew up in Texas around Demi Lovato and visited her at her concert recently at the the Staples Center, and was able to give her a big hug." Q: I recently watched your latest movie, Hoovey,— which was so heartwarming and inspiring, by the way— and could not believe how right you were for that role. Out of all the roles that you have played in television shows and movies, which character do you feel like you related to the most and why? A: Thank you, I think Hoovey is a very inspirational film as well. Hoovey was probably the most relatable character I’ve ever played. I grew up playing basketball in a smaller town in Texas named Lewisville. When my brother Chad died in 2011 it was a shock and very devastating, but ultimately it brought my family together and made us stronger, and I’ve used Chad’s death as inspiration towards creating that role. 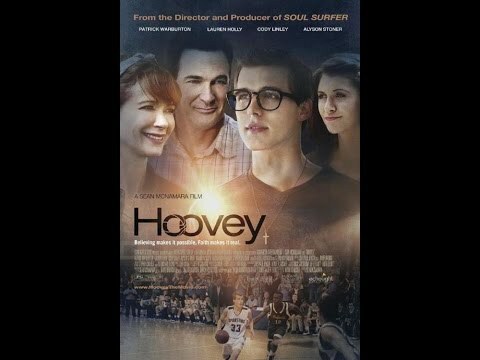 Hoovey is an underdog story about perseverance and the power of love, and I’m looking forward to supporting it as the opening feature at this year’s Burbank International Film Festival in September. 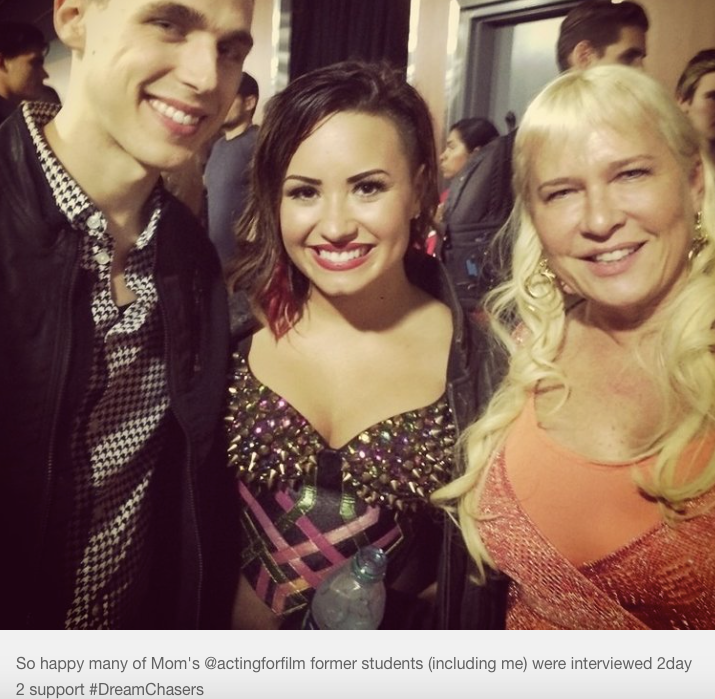 Q: I see that you’ve been following in your mother’s footsteps and have coached acting classes. What is your favorite aspect of coaching? What advice would you give to someone who is considering pursuing that career choice? A: My favorite aspect of coaching is getting to help other people do what they love to do. It’s very rewarding to work with the next generation, because I learn so much from them and their excitement rubs off on me. My advice to anyone pursuing acting would be to practice your craft every day. If you can, take class where you are learning techniques and practicing your craft. Study acting on T.V., in books and remember that if stay focused and believe in yourself, anything can happen truly. Q: I’m sure being a celebrity isn’t always easy, so what is the most bizarre thing that a fan has said/done to you, and how did you react? A: I’ve had some pretty bizarre fan encounters, when I was in Mexico visiting a school I had a mob of screaming girls all charge after me and trying to hug me at once, one of the girls took my hat and I started to feel a bit overwhelmed, but eventually I got my hat back and arrived safely onto the bus. Q: You are a man of many talents such as singing, dancing, and acting. Do you have any more interests or hobbies besides those, and if so, what are they? A: I live with three dogs, I love animals and I’m vegan. 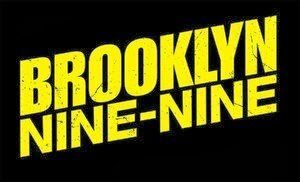 I enjoy reading, writing and improv comedy. Q: Who would you say is your hero and why? A: I have a few heroes, I admire my grandpa Alton Martin, because he is loyal, loving and an honest family man. Growing up I looked up to Steve Nash, because he’s such an amazing team player and an overall extremely talented guy. As far as actors go I think that it’s cool that Leonardo Dicaprio uses his platform to bring awareness to important issues such as wild life, global warming and ecological issues. Q: Can you tell me about your funniest moment on the job? A: Working with Patrick Warburton on Hoovey was super fun, because he’s such a genuine person, but equally as funny! He told me stories of when he started acting. There is a scene in the movie where Alyson Stoner, Lauren Holly, Patrick and I are saying a prayer at the dinner table, and when it was filmed at the time it had been at least a twelve hour day. In between takes we decided to play a word game where you mix the letters up in a word and say the phrase all jumbled up and see if the other people can solve the puzzle. The things that we were saying and the reactions to them were roll on the floor priceless. I was laughing so much that I cried, my stomach hurt and I could barely even breathe. Q: 10 years ago, where did you think you would be now? What advice would you give to your past-self? Q: Can you tell me three things that not a ton of people know about you? A: I enjoy traveling around the world and merging with new cultures. I like playing ping-pong with my roommates and playing frisbee with my boxer, Logos. My initial thoughts about him were spot on. Don't you agree? He is truly an inspirational and genuine guy who took the time out of his busy day to answer my questions. Well, there you have it! 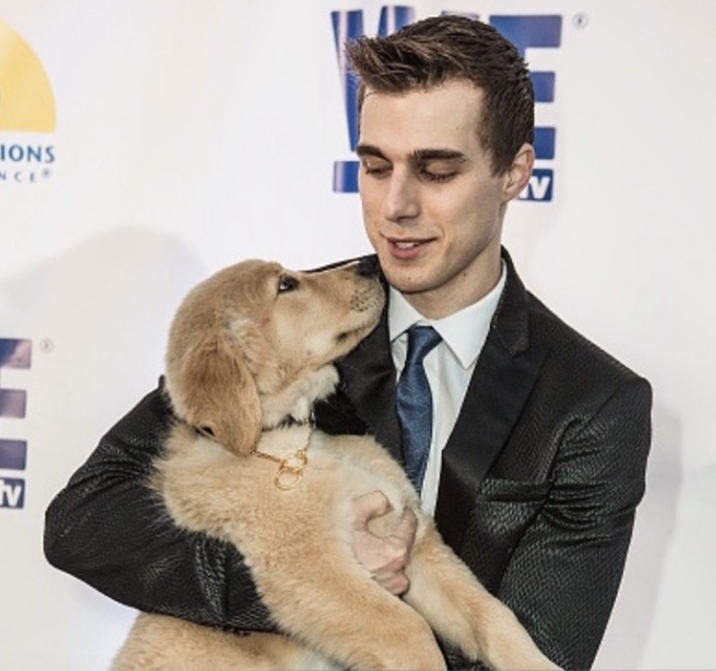 Now you have a little insight into the life of the unbelievably kind Cody Linley. Note: Please excuse any grammatical errors. All responses were kept in their original form to ensure authenticity.